Once, I was allowed to hold the roundest object in the world. It cannot be dropped, because it is the subject of an international project to “solve” the kilogram. You see, scientists have a bit of a crisis on their hands. Those objects we use to measure the world around us – despite their seeming endurance – have turned out to be too specific, too vulnerable to that very world over time. One German metrology lab's goal is to render the kilogram artifacts – upon which all standard measurements of mass are based – irrelevant by securing an infallible theoretical model of the kilogram. To this end, metrologists are using a perfect silicon-28 “kilosphere” and counting every atom within it. Someday, the kilogram will be nothing more than a number. A Platonic ideal of the Earth – once considered perfectly round but since discovered to be a bit too wide around the middle – has been mapped onto this superlatively perfect object in hopes of finally attaining a model precise enough that it does not suffer the limitations of our material world: an object that will transcend realness in order to quantify it. The roundest object in the world is about the size of a grapefruit, with a slick, mirrored surface that bends my face around it. When I hold it in my hands, it strikes me that it feels like it weighs about a kilogram. It's a ridiculous thought, of course, because it is exactly one kilogram. 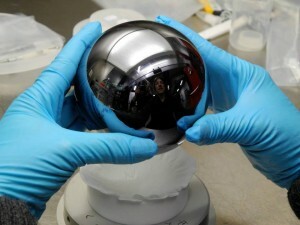 It's a bizarre object, with aspirations to be both the kilogram and no-thing at all. I have internalized this signifier of weight – the “feeling” of a kilogram – into my body, into my senses, as a way of understanding my relationship to the objects around me. In a kind of proxy vertigo, I can't stop fantasizing about dropping the two-million-euro kilosphere. I want to hear it smack the ground, in an expression that it is in fact real, and vulnerable to falling, just like the rest of us. I visited the International Bureau of Weights and Measures in Sevres, France, in 2013. When I was making my way there, I was perplexed that it didn't show up on Google maps. It was with good reason: The facility has extraterritorial status and cannot be claimed by any one country. Its importance is so great that neither the Nazis nor the American liberating forces set foot inside it during and following WWII; it was protected by its status as non-place. Due to suspicion of dubious identity, I got in trouble trying to get onto the property. But finally, after a surreal kerfuffle, the French security staff – bemused by my genuine ignorance – gave up, gave me a name tag, and let me through the gate. I asked about the “original” kilogram that lives there (the one German metrologists are working to outmode), knowing I wouldn't be allowed near it. I find this object beautiful because it is hopelessly flawed. The kilogram is so vulnerable that to walk into the vault where it is kept is to change its very definition – even a variation in light exposure can cause its surface to change. The gracious woman who took me around, Janet Miles (her surname pronounced to the imagined chagrin of her metric-minded colleagues), told me that they only open the door to the kilogram's vault once a year, just to check on it. I couldn't help imagining a Great-Escape-esque plot turn wherein the artefact would be discovered to have fled through a tunnel it spent the year digging. If that has not in fact happened, then it's continuing to gain weight (an ever-so quirky, human quality) in its fortress-void, on its island of solitary confinement. Ms. Miles also let me take photos of some of the artifacts, but only if I promised not to show them to anyone. The absence of this building on the map, the sensory deprivation of the sequestered kilogram, the photographs that should never be viewed – it's as if I stumbled upon an absurd quest for the erasure of all things real. I asked Ms. Miles if they also weighed the kilogram. “Oh no, of course not.” Ridiculous question. It measures everything, but it itself cannot be measured, granting it a freakish weightlessness. And this outside world that it defines is the very thing that threatens its authority as a non-representational entity; contact with the outside world would invariably undermine its strained faux-perfection. Meanwhile, this single kilogram-object determines everything – from the newton to the pascal to the joule, right on up to the distribution of rare earth elements and precious stones, impacting the lives of commodities brokers, fruit vendors, and weighers of babies alike. Rare earth elements may be the biggest factor of all in this rush to solve the kilogram problem. There is some irony to be found in the fact that every single one of our computer and communication devices require a bit of rare earth element to function. Those objects that propel our false sense of a virtual world that is superlatively smooth and decoupled from materiality – those objects that grant our lives a seeming weightlessness, that connect us via the skies – they are absolutely of the depths of the Earth itself. Smack. The fall of an object: Is the fall of an object an object's demise, its negation? Or is it simply a reworlding of an object? The idea of an object can fall from grace, as an actual object can fall in space – its potential energy acted upon, its gravitational entanglement with the Earth affirmed both in the playing out of physical laws and in the movement of a material that much closer to its source: the ground. But weight is not inherent to an object; ultimately, it is a manifestation of the relationship between an object and the planet. The weight that I have on Earth is the weight of the Earth. As the planet gives an object weight, so, too, does an object give the planet weight. The fall of an object is this recognition and seduction of one to the other. To drop my phone then takes on profound meaning: As an object, my phone has far more in common with the Earth below than the ether above, in both materiality and gravitational tethering. If given the chance, would it plunge itself back down into the bedrock from whence its minerals came, to rejoin the deep timeline of planetary stone in self-annihilation? The notion of a falling mobile phone points us back to the contingencies of the Earth, of earth. Just like any object, my phone, too, gives the planet weight – in the vertigo of all things real.